With Bernard and Jin pulling seafood out of the tropical waters surrounding the island, another thing our Lost survivors could use is some good sake. 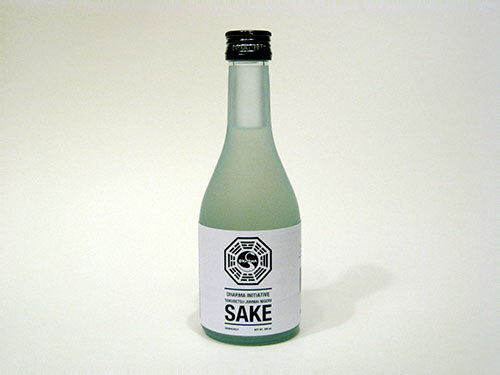 Actually, with all the show’s topsy-turvy timeline and plot zaniness we could all probably use some good sake. Someone who did get some good sake recently was our good friend Kamen Rider. For his birthday, KR received a pallet drop of DHARMA Initiative products: DI Sake, DI Instant Coffee, a Hydra station coffee mug, and a notebook from the Staff station. I’m not sure if the combination of goods constituted some sort of stimulant/depressant-type experiment, but who can tell what those Hanso Foundation people are up anyway? This entry was posted on Friday, May 2nd, 2008 at 8:09 am	and is filed under Film/Video, Food, Graphic Design, Uncategorized. You can follow any responses to this entry through the RSS 2.0 feed. Responses are currently closed, but you can trackback from your own site.